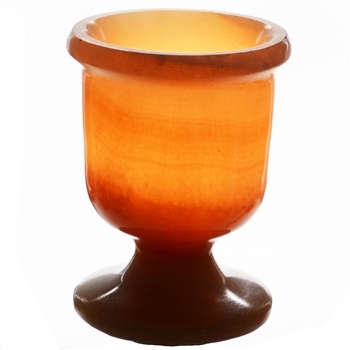 Alabaster Lotus Flower Candle Holder 4.5"
This Alabaster vase is manufactured by hand, using alabaster from every commercial quarry in Egypt. Alabaster is a natural, translucent marble which can vary in color from a clear lemon color to a rich shade of mango orange or even a very light cafe au lait. Each piece will be unique in color and variation from the photo should not be considered a flaw. Elegantly carved from gorgeous oriental alabaster, this charming tealight holder lamp gets its inspiration from the lotus flower. Alabaster Lotus Flower Candle Holder 11.5"
Alabaster Cylindrical Candle Holder 11.5"
Alabaster Lotus Flower Candle Holder 6"
Alabaster Cylindrical Candle Holder 5.5"